Total Face is clinically and dermatologist tested, non-irritating and allergy tested. Wash face. Towel dry skin, leaving it SLIGHTLY damp. Apply small amount of cream to tip of finger. Distribute cream around face. Massage into skin. If cream does not absorb readily use less and/or dry skin more before next application. Use morning and night. This moisturizer is very rich. Please allow several days for your skin to acclimate. Aqua (Water), Aloe Barbadensis Leaf Juice*, Glycerin, Caprylic/Capric Triglyceride, Cetearyl Alcohol, Cetyl Alcohol, Coco-Glucoside, Persea Gratissima (Avocado) Oil, Sodium Hyaluronate (L), Squalane, 3-O-Ethyl Ascorbic Acid, Helianthus Annuus (Sunflower) Seed Oil, Thioctic (R-Lipoic) Acid, Coffea Robusta (Green Coffee) Seed Extract, Retinyl Palmitate, Eucalyptus Globulus Leaf Oil, Lecithin, Ubiquinone (CoQ10), Soy Isoflavones, Panthenol (D), Carnitine (L), O-cymen-5-OL, Ethylhexylglycerin, Xanthan Gum, Caprylyl Glycol, Trisodium Ethylenediamine Disuccinate, Polysorbate 60, Phenoxyethanol, Potassium Sorbate, Mentha Piperita (Peppermint) Oil, Alcohol, Polysorbate 80, Phenethyl Alcohol. SILICONE FREE. 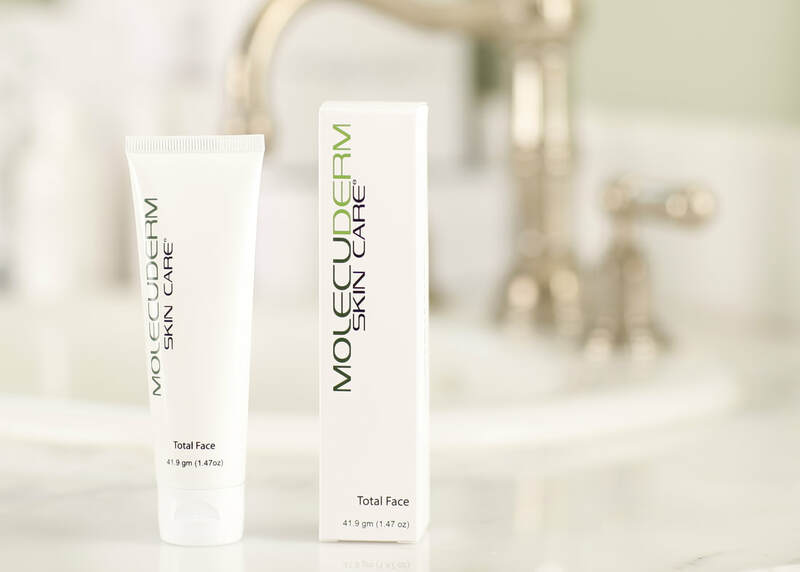 M-Cleanse is clinically and dermatologist tested, non-irritating and allergy tested. Wet face with water. Dispense approximately a dime sized amount of M-Cleanse into the palm of hand. Add water and make lather. Wash face and throat for approximately 30 seconds. Rinse completely with warm water. Use morning and at night. Aqua (Water), Lauryl Glucoside, Caprylyl/Capryl Glucoside, C10-16 Alkyl Glucoside, Glycerin, Disodium Laureth Sulfosuccinate, Polysorbate 20, Butylene Glycol, Xanthan Gum, Sodium Lauryl Sulfoacetate, Sodium Lactate, Hamamelis Virginiana (Witch Hazel) Water, Glycolic Acid, Vitis Vinifera (Grape) Seed Oil, Ormenis Multicaulis Oil, Sodium Gluconate, Prunus Armeniaca (Apricot) Kernel Oil, O-cymen-5-OL, Ethylhexylglycerin, Trisodium Ethylenediamine Disuccinate, Citric Acid, Eucalyptus Globulus Leaf Oil, Phenoxyethanol, Mentha Piperita (Peppermint) Oil, Alcohol.